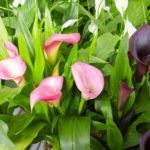 I have calla lilies growing down my long driveway. How do I care for them in the winter? They look awful. Can I cut them back?